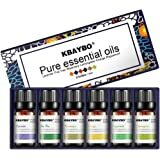 Essential Oil Blends Set : Avoid contact with eyes; Keep out of reach of children; For external use only. Each 10mL Bottle, Contains the following - Lavender, Peppermint, Sweet Orange, Tea Tree, Lemongrass and Eucalyptus for Aromatherapy. 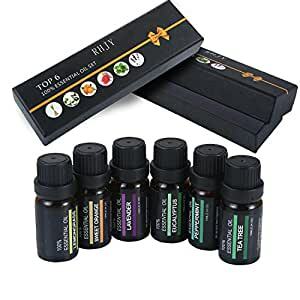 Pure Essential Oils usage : Diffuser oils, humidifier oils, skin care, massage, natural perfumery, foot and hand care, soap making, bath bombs fragrance, home scents. The Essential Oils can be used with compatible aroma diffusers or humidifiers, adding a few drops of oil to the water, the diffusers or humidifiers will release a scented vapor. 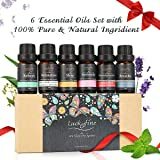 Aromatherapy Essential Oil Blends perfect for massage therapy, health without side effects, relaxing after a long day,improve your sleep and help you calming alike,help add more vibrancy to your life than ever before. 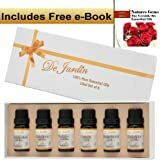 Aromatherapy Oils perfect for the bedroom, living room, bathroom, study room, conference room, yoga room, car, spa, and more. Lavender: The most popular scent, relieves anxiety and depression,creates a warm and welcoming environment. Lemongrass: Lemongrass can also be used as an astringent, skin toner, and is great at enhancing skin's glow. Peppermint: Gives a cooling sensation,clears and stimulates your nerve, for when you need a clear mind. Eucalyptus: Naturally anti-inflammatory,cools and clears respiratory system. Tea Tree: Known as the healer, effectively cures fungal infections and boosts skin suppleness. Sweet Orange: The fruit of joy, uplift your mood with a slice of sunshine in the scent,promotes positive attitudes. 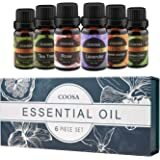 Common Ways To Use: This essential oil starter kit is suitable for diffusion, vaporizer, inhalation, oil burner, massage, perfume, home care, cleaning, spa, and more.